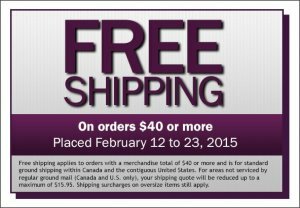 Free shipping applies to orders with a merchandise total of $40 or more, excluding the purchase of gift cards, and is for standard ground shipping within Canada and the contiguous United States. For areas not serviced by regular ground mail (Canada and U.S. only), your shipping quote will be reduced up to a maximum of $15.95. Shipping surcharges on oversized items still apply. 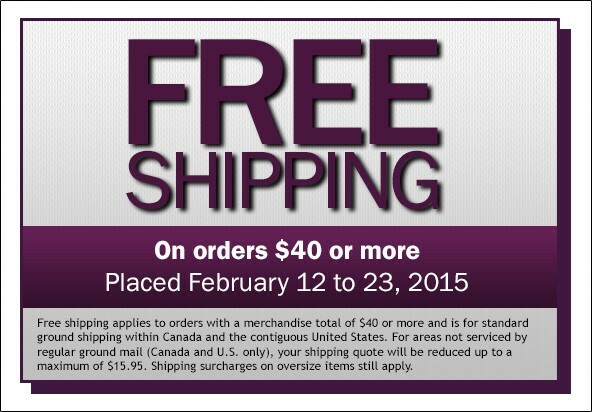 To take advantage of this offer online, simply place your order as usual. Shipping charges will be removed automatically at the time of checkout. Orders can also be placed by phone, fax or mail.